Families react to news on a Supreme Court decision blocking Obama’s immigration plan, which would have protected millions of immigrants from deportation, in front of the U.S. Supreme Court, on June 23, 2016 in Washington, DC. 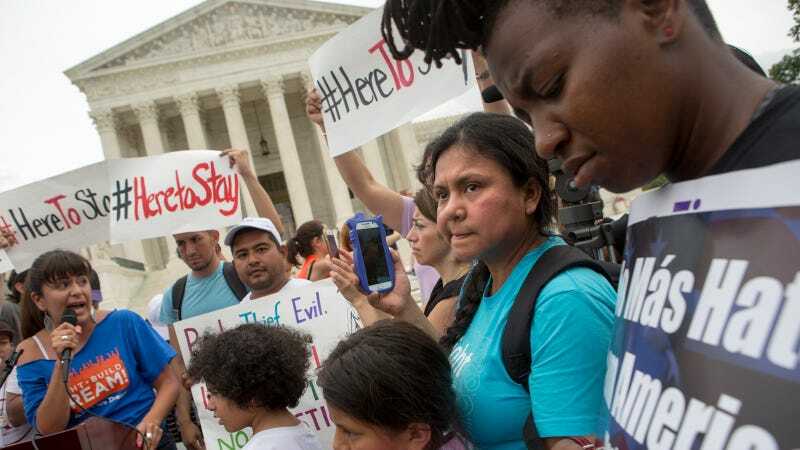 The Supreme Court has overturned two lower federal court decisions and ruled that immigrants, including asylum seekers and those with permanent documented status, are not entitled to periodic bond hearings while under detention. This effectively means they can be detained indefinitely if the government is considering deporting them. The lead plaintiff in the case, Jennings v. Rodriguez, is Alejandro Rodriguez, a documented permanent resident of the United States who was convicted for joyriding and a misdemeanor drug possession. After the second conviction, officials detained him for three years, without access to a bond hearing, and entered him into deportation proceedings. His case, taken on by the ACLU, expanded to include others facing months or years-long detentions: asylum seekers, legal residents who served a sentence for committed a crime (including minor offenses), and immigrants whose claim for admission is under dispute sued for the right to a hearing before a judge to evaluate whether imprisonment is warranted. The 5-3 opinion stated: “Immigration officials are authorized to detain certain aliens in the course of immigration proceedings while they determine whether those aliens may be lawfully present in the country.” (Justice Kagan recused herself in November due to previous involvement with an earlier phase of the case as the Solicitor General under Obama). Previously, the Ninth Circuit Court of Appeals ruled that detained immigrants receive periodic, individualized bond hearings to assess threat and flight risk after detention exceeds six months. However, the Obama administration fought the ruling, arguing that Congress controls immigration laws and thus the government can detain “aliens seeking admission to the United States.” The Trump administration has taken the same position. With its ruling, the Supreme Court has sent the case back to the appeals court for further consideration—meaning the landmark immigration case could again wind up at the high court. In a sharp dissent, Justice Stephen Breyer wrote, “many members of these groups win their claims and the Government allows them to enter or to remain in the United States,” noting that two-thirds of detained asylum seekers are granted asylum and almost 40 percent of detained immigrants who have served criminal sentences are offered relief. No one can claim, nor since the time of slavery has anyone to my knowledge successfully claimed, that persons held within the United States are totally without constitutional protection. Whatever the fiction, would the Constitution leave the Government free to starve, beat, or lash those held within our boundaries? If not, then, whatever the fiction, how can the Constitution authorize the Government to imprison arbitrarily those who, whatever we might pretend, are in reality right here in the United States? The answer is that the Constitution does not authorize arbitrary deten­tion. And the reason that is so is simple: Freedom from arbitrary detention is as ancient and important a right as any found within the Constitution’s boundaries.